The second purpose was advertising. With this special Comedy Central intended to drive consideration and consumption of the breadth of their programming – namely the Kroll Show, Nathan for You, Broad City, Key and Peele, Drunk History, Workaholics (returning in January) and @Midnight. I was initially drawn to the special, which aired Thanksgiving day (and re-aired each day thereafter through the following Sunday), because I was excited for a kickoff to the Christmas season with a Comedy Central twist. I was also excited to see Stephen Colbert in character one more time (in addition to ~12 final episodes of “The Colbert Report”) before he bids farewell to Comedy Central and begins his new role in David Letterman’s seat on CBS. The special was comprised of Christmas-themed sketches from each of the shows mentioned above. So there was a Key & Peele sketch, a Kroll Show sketch and so on. I liked how Comedy Central structured and presented the sketches because their typical viewer is high depth and low breadth – meaning that they watch a lot – but they only watch a select few shows. For example: people who watch The Colbert Report usually watch nearly every episode that airs (high depth), but they probably don’t watch other shows on Comedy Central like Key and Peele or Tosh.0 (low breadth). Fun Fact: Tosh.0 is one of the top rated shows on basic cable – who knew? Overall, I love this non-traditional marketing execution from Comedy Central because the product is the advertisement. To be specific, I love how Comedy Central uses this product to speak to their intended audience. The sell in the advertising aspect of this Christmas special isn’t “HEY! watch the Kroll Show on weeknights at 11!” (which is an oft employed method of advertising for Comedy Central), rather it is an experience. 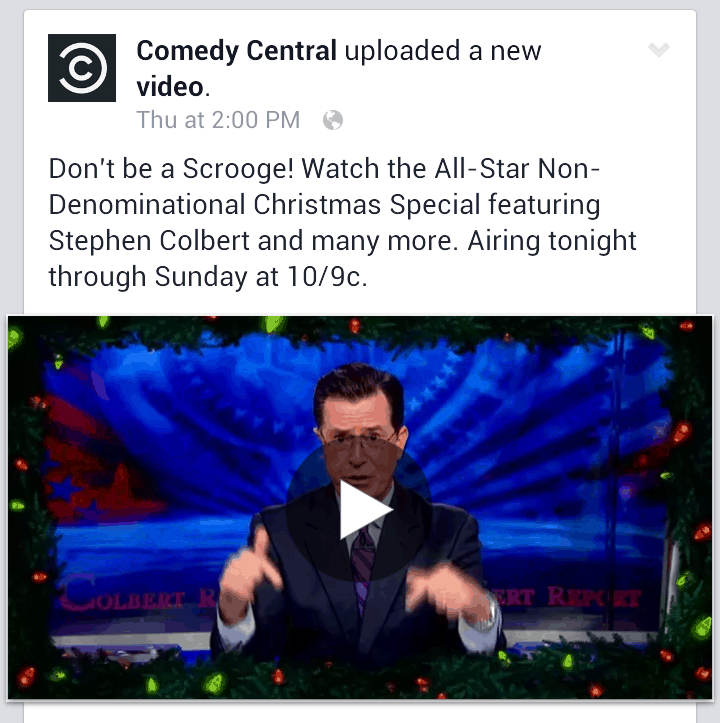 Comedy Central invites viewers to enjoy a special experience – a holiday special. And who doesn’t like holiday specials? Particularly those with titles that are hilariously exclusionary while claiming not be exclusionary (Comedy Central’s nondenominational CHRISTMAS special). In this experience, viewers get to watch funny skits while Comedy Central subtly, intent upon driving breadth of viewer engagement, communicates a “You like that? there’s more where that came from” throughout the episode. Simple but genius. This was a very smart way to drive engagement. 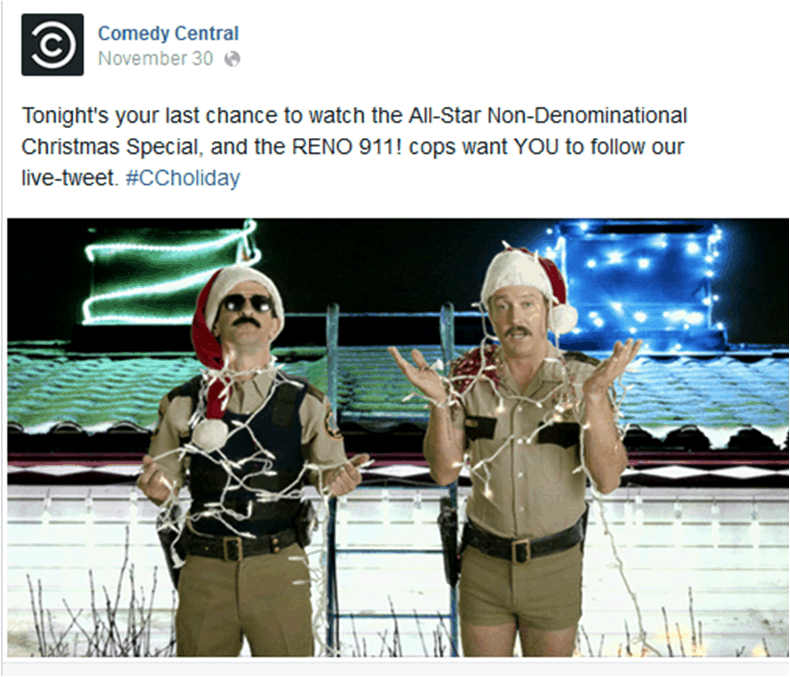 Those who are highly engaged with one particular show on Comedy Central are also highly likely to tune into the Christmas special to see the characters from the show they watch in a new setting – and while they do so, they are being enticed to increase the breadth of their engagement with Comedy Central. As was discussed in a previous entry – there are two ways to drive revenue – and looking to your existing customer to purchase/consume more of your products is the easier and less expensive way to do it. Nice work Comedy Central. post script: I also liked the social media aspect surrounding the “Product as Advertisement” marketing execution. Comedy Central pulled select Facebook comments and tweets to feature in a live commentary that accompanied each night’s rebroadcast. Definitely a great way to get people to tune in on multiple nights.